One of the most important steps you can take to prevent back pain or ease any existing back pain is to keep your spine supple (or flexible). In the words of Dr. Alan Gardner, a famous spinal orthopaedic surgeon and spokes man for the “Back Care” organization, - “Your back loves movements.” He also states “It hates being stuck in one position for long periods, yet we will sit for hours in front of a computer or TV, or drive long distances without a break. Get into the habit of stretching; - it is vital to good back health.” Simple stretching exercises done on the floor each evening will help anyone with back pain and keep your spine flexible, strong and supple. The “Back Care” organization has a useful information leaflet that suggests suitable types of exercises. “When you are horizontal, you remove all postural stress on your spine,” says back expert Mr.Nigel Summers, the author of the book The Art of Back Stretching,” and the inventor of the “Back-stretcher” unit. He retired from the US Marines at the age of 24 years, because of a chronic and hereditary form of arthritis known as “aukylosing spondylitis.” He reminds us that the average head weighs 11-13 lbs, and we balance it on a stick of building blocks, which are in fact our own vertebrae. We area couple of centimetres shorter by bedtime than we are upon waking in the morning, because the fluid filled cartilage discs between our vertebrae become flattened and dehydrate during the day. Doing no exercise means that rather than having toned, taut back muscles, they atrophy and weaken, so that when you want to use them you cannot. Any form of exercising, (no matter how gentle), will work your back muscles and keep them strong, says Dr Kamaljit, whether it is cycling, walking, swimming, yoga or simply standing on one of my blood circulation machines. Ironically, sports that involve sudden bending and twisting, (such as racket sports, golf & rugby), can trigger back problems too, so it is important to do warm up exercises and also not push yourself too far, too soon. Swimming is excellent, but opt for something like the front crawl, rather than the breaststroke, that involves craning your head and jutting your chin, which can compound a back problem. A saggy mattress is often one of the most common reasons for back problems. Dr. Alan Gardner states that “Going to sleep should be a great period of recovery for your spine, but if you have a mattress that is too soft, it will aggravate all of the stresses and strains.” He further stated that “Equally, if it is too hard, it will distort the natural curves in your spine.” The key is to choose a mattress that is firm but comfortable, and which also supports the natural S-shape of your spine, rather than forcing it into the slumped C-shape that is so bad for it. A good mattress should support your lower lumbar, lower back and neck. You should be able to sink into it by a few centimetres, so that your whole spine is fully supported. Dr. Kamaljit strongly recommends the ‘Accu-Magnetic Mattress” with an in-built massager, which helps to stimulate the metabolism. This acupressure / magnetic mattress can be the energy source in providing an ‘improved quality of life’ for you. Hours of hunched posture locks your back into an unnatural C-shape in the same way that a saggy mattress does, so work out something to remember to periodically sit up straight; (decide to do it each time that you look at your watch, or set your alarm every hour to make sure that you do this. If you spend long hours at a computer, then check that the screen is at eye level & facing straight towards you, plus your keyboard should be at a comfortable height, with your forearms parallel to the floor. Your chair should be adjustable and support your back, and when sitting upright your feet should be flat on the floor. If driving take regular breaks, and buy one of Dr. Kamaljit’s “Magnetic Lumbar Support Belts.” Not only do many cars have poor seating, but driving puts added strain on the spine, because constantly changing gears with the same hand and leg is a repetitive, one sided activity. All kinds of daily activities, such as picking up heavy shopping in one hand, carrying a child on one hip, and even cradling the telephone are all one sided activities that put enormous strain on your back, and these activities overload your spine, compounding any potential back problems. Turn your own bad habits around, split your heavy shopping into two bags (one in each hand), and hold your child with both ands under their bottom, letting them wrap their legs around your tummy. When you lift something bend your knees and keep your feet wide apart, they bend your knees again when you put it down. You can also give your chid a backpack, (rather than a satchel), so that the weight of their heavy school books is evenly distributed on both shoulders when they have to carry them. Complementary therapies including acupressure, magnetic therapy, osteopathy, physiotherapy, yoga or acupuncture can help to treat and prevent back pain. Studies on volunteers with back pain using these supplementary treatments have shown that ‘muscle spasm,’ can be reduced, and that they can bend over to touch their toes. A trial at the “Welsh Institute of Chiropractics” in the University of Glamorgan, has shown that glucosamine sulphate, (which is recognised for improving joint health), can prevent shrinkage of the spine, while bromelain, (a pineapple enzyme), is an anti inflammatory substance. 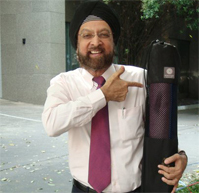 Dr Kamaljit Singh has various types of magnetic, infrared, and acupressure spine rollers & massagers, which help to stretch your spine, plus relieve the pressure on your discs and back muscles. In a study at the “Navkiran Institute of Alternative Medicines,” showed that acupressure, magnetic treatments and lying on magnetic mattresses for periods of time over 10-days, regularly helped to lengthen the spine by up to 1-inch (2.5 centimetres). Shortly before this article went to print, a team member, Mr Mani, from the champion Bangkok Indian Cricket Club, (who have been the top team five times), came down to Dr. Kamaljit with a serious back problem. Mr. Mani, who plays both badminton plus cricket had been training too hard and seriously injured his back to the point where he could not bend down one side, and the various treatments with drugs, plus placing him in traction (with which Dr. Kamaljit did not agree), had brought no success over some considerable time. His upper body was plainly seen to be bent to one side, but after staying in Pattaya for three days and receiving three treatment sessions daily, Mani went back to Bangkok a much straighter and happier man, at considerably less cost than he had been paying some of the hospitals. Another ongoing case involves the case of an elderly Swiss woman, who had undergone a major shoulder operation in Switzerland, which was not so successful, so she has come to Pattaya for treatment by our internationally known Dr. Kamaljit Singh, and this is on-going at this point in time. Dr. Kamaljit treats a very wide range of physical and mental disabilities using naturopathic techniques, without the use of drugs, using his own inventions of electro-magnetic equipment and sophisticated medical techniques, (including the new “Bio-Disc,” which he also distributes as the regional agent).